It’s a story of how a wonky aviation pact became a bitter, lobbyist-fueled international incident when Peter Navarro, President Donald Trump’s trade adviser, repeatedly contradicted the State Department’s carefully crafted script about what the agreement actually said. The Emiratis complained to the administration. The drama has played out as Navarro, a nationalist who has sought aggressive protections for U.S. businesses, seeks to assert authority from his perch at Trump’s recently created White House trade and manufacturing policy shop. 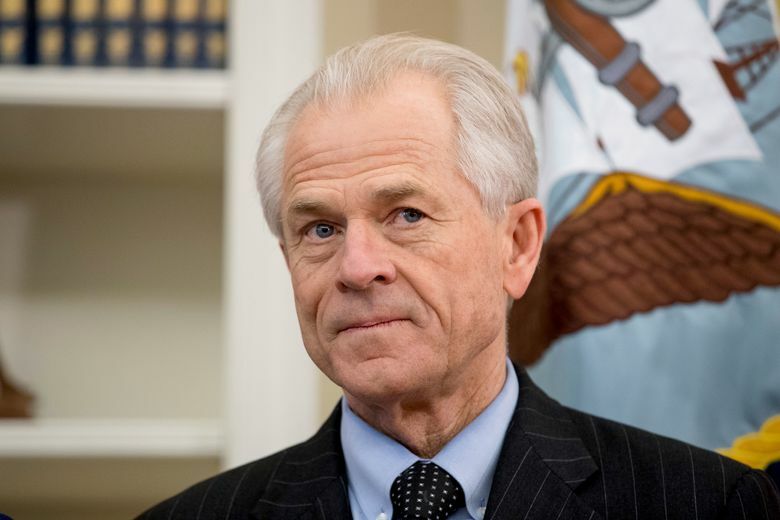 Earlier in May, tensions between Navarro and Treasury Secretary Steven Mnuchin over Navarro’s role in China trade talks erupted into a profanity-laced confrontation in Beijing, Bloomberg and the website Axios reported. In the airlines dispute, the most explosive issue was so-called Fifth Freedom flights, by which Emirati airlines fly directly from the United States to places like Europe, never stopping in the UAE. The major U.S. airlines loathe such flights, which compete with their own lucrative routes. Navarro has insisted that the deal includes a “freeze” in such flights. The State Department, which overseas international civil aviation agreements, insists it does not. From the start, Navarro sought to exert influence over the negotiations, pushing for stricter limitations on Persian Gulf airlines, according to half a dozen U.S. officials and other individuals involved in the dispute. They weren’t authorized to discuss the issue publicly and requested anonymity. After a similar deal with Qatar’s airline was reached earlier, Navarro intervened last-minute and demanded changes to the agreed-upon text, two of the individuals said. So concerned was the State Department that the deal would be scuttled that at one point Assistant Secretary of State Manisha Singh urged parties with a stake in the fight, such as the U.S. cargo airlines, to voice concerns about Navarro directly to the White House, other officials said. Navarro disputed the notion he had undermined the State Department or created discord over the agreement. But behind the scenes, the dispute devolved into one-upmanship, word games and subtle subterfuge, magnified by hard-hitting lobby groups that have seized the chance to exploit divisions within Trump’s administration. The deal with the Emiratis was reached May 11 after months of negotiations. The agreement itself glossed over Fifth Freedom flights, which were instead resolved in a “side letter” from the Emiratis. In the letter, obtained by The Associated Press, the Emirati economic minister says both of his country’s airlines “voluntarily” informed the UAE that they had “no current plans in place to make any changes” to the routes. There is no talk of a freeze or commitment not to change those plans in the future. By design, the letter was to be kept private, allowing both sides to save face by staying intentionally vague about its contents. But within hours, both the U.S. airlines and the Emiratis rushed to define the agreement on their terms. Anticipating that scenario, the State Department had circulated talking points ahead of time to be used by government spokesmen if asked whether the deal included a freeze. “No,” said the talking points, which were obtained by the AP. But then Singh and Navarro hosted a conference call to brief industry lobbyists about the deal, and the situation deteriorated. By longstanding practice, such briefings are generally considered private and off the record. The Partnership for Open & Fair Skies immediately posted a partial transcript of the call on its website and promoted it on social media with paid ads and a photo of Navarro. The White House was incensed, one official said. A few days later, the transcript was quietly pulled down from the Partnership’s website. The AP preserved a screenshot from the original post. The Emiratis, meanwhile, protested to the administration, insisting the mess be fixed. And so began the battle of the written statements. A State Department notice pointed out that “all rights” to adjust routes remain in place, calling the agreement the “result of the Department of State-led effort.” Three days later, a White House statement stuck to the “no current plans” language, but downgraded the State Department’s role, saying the deal resulted from “a White House task force.” The next day, the State Department released the full text of the agreement — but not the side letter addressing the flights issue. At the last minute, Navarro was added as a speaker to an event held Monday at the conservative Hudson Institute. State Department officials called around to groups aligned with the Emirati position and encouraged them to show up and ask questions that would force Navarro to clean up his past statements, three individuals familiar with the calls said. Just as Navarro took the stage, an op-ed under his name appeared online in the Washington Examiner in which he reverted to the State Department talking points about “no current plans,” while avoiding any mention of a freeze. For his remarks at the event, he read his op-ed word for word. Americans for Fair Skies, a lobby group formed by Delta, paid part of the cost of the event, the Hudson Institute said.